Melissa Murray Bailey starts Election Day at Annunciation Church polling place at 10th and Dickinson in South Philly. The sun had just peeked over the Delaware River horizon, and committee person Mike Mazzuca was already dealing with his first Election Day hassle. Outside Annunciation BVM Church at 10th and Dickinson streets, scaffolding shields the front of the building. Near the side door – where voters will go to the polls to vote in mayoral, council, judicial and other races (both contested and not) – the painters wanted to close off the sidewalk to passersby. “You can’t do this to me today!” he said aloud to no one in particular. That reaction was for good reason, considering this is Election Day at a highly used polling place and, unbeknownst to him, the Republican mayoral candidate, Melissa Murray Bailey, was about to start her day on this very spot. 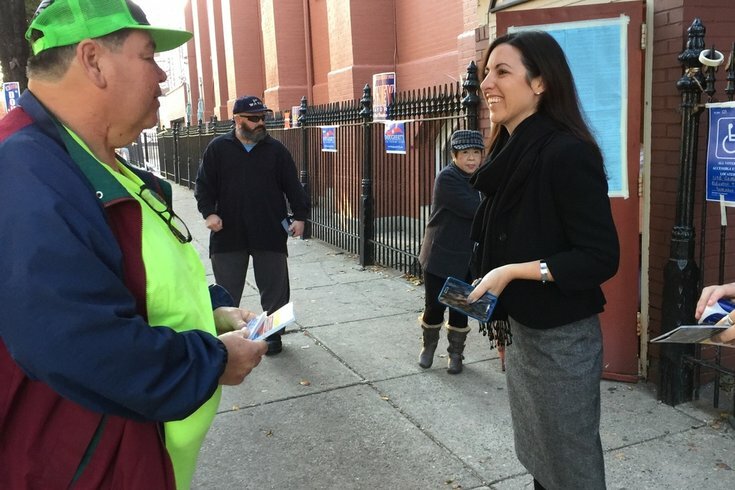 “Nobody’s got a crystal ball,” said one poll worker after the 36-year-old candidate arrived with her sister Lauren and shook hands with people working outside the polls. What he was trying to say – in code language, so he didn't sound like his peer, who noted that “you have a better chance of meeting Santa Claus” than learning later Tuesday night that Jim Kenney won’t be the next mayor of Philadelphia – was that he respected the effort she put into the race. Still, he doesn’t think she’ll come close to winning. Bailey has heard a lot of that during the past several months, including at her first stop of the last day of her inaugural political campaign. She got up at 5 a.m. and hit the streets with her sister Lauren, who said she happily came up from Annapolis, Maryland, to be part of this special day. About 15 minutes later, that theme intensified when the sisters arrived at Guerin Recreation Center, located across South Philly at 16th and Jackson streets. They were greeted by poll worker Ben Tapas who, sporting a U.S.S. Tarawa cap, was excited to meet the candidate for whom he set up a wall display urging voters to vote the full Republican ticket. “I did so much for her without even knowing her,” said Tapas, before asking a reporter to take a photo with his son, Bailey and her sister. Handing out some of the 3,000 stickers and 100-plus T-shirts they have in the Prius, Bailey clearly enjoyed the warm reception throughout this active polling place. She was led through the building by Terry DiNinio, who graciously offered coffee and warm pretzels. Bailey was told she did well in the debates and looked good on TV. Before she headed off to cast her vote – presumably for herself – at Society Hill Dance Academy, Bailey told PhillyVoice what she was expecting from the day.